Welcome to the glorious world that is Ultima Online: Outlands! You have journeyed far and long to reach this destination and this will be your guide in learning the basics of how to function in this world that is so grand and daunting. In this guide, I will explain a bit about how to choose your client, create your character, the basics of the character (moving, looting, fighting), what each skill does, stats and equipment, and a few other things to help you get started exploring and learning the rest however you chose. Gigantic play button in top right. Be sure to immediately press the verify button to make sure you are up to date with the correct files. If you do not see the verify button, press the big O in the top left corner to expand that menu. Each of these three icons is a button to decide on which client you will use. The first one UOS is called UO Steam. I recommend this client later when you have had some time to explore the game and play a bit, at first all the powerful features you get from steam will be of no use to you, and in fact will probably make you feel confused. The second button is the vanilla UO client. I do not recommend this option. The third option is Razor. Razor is the name of the assistant program that will help you do repetitive things later on, and also a few other nice things once you have a basic grasp on the game. Let's select this option. The first thing you want to do before even creating a character is to set up a few basics. Be sure to put in 1100x720 for the Force Game Size. Now you are ready to create an account. In the account name area place the name you would like to label the account, then place in a password. Please store or write down your account name and password somewhere so that you don't forget it. On this shard, you are allowed 3 accounts, each with 5 characters to start with. I recommend naming your accounts with the suffixes of 1, 2 and 3. For example: Sorceress1, Sorceress2, Sorceress3. This way I won't forget the other account names later. Once you put in an account name and password the server will auto create your account and take you to the character screen. First, choose your name. Then at the bottom right, chose male or female. The Gargoyle and Elf options are disabled, you can only be a Human on this shard. Assuming this is your first time playing, try to pick one of the starting characters that sound interesting to you. Once you get a feel for the game you can always go back and make a new character. 1. Bard - This character template starts you with some musical instruments and some magery to cast a few basic spells. It gives you skills to pacify, provoke and weaken monsters with your instruments. 2. Ranger - This character template starts you with a bow/arrow and the means to heal yourself and to create more arrows through lumberjacking. It also gives you tracking which you can use to find monsters or animals easier. 3. Warrior - This character template starts you with all of the melee weapon fighting skills and the means to heal yourself. 4. Blacksmith - This character template starts you with the skills to mine, make metal items and to craft tools with tinkering. You also get a weapon to defend yourself and some mace fighting! 5. Lumberjack - This character template starts you with the skills to chop trees, make carpentry items, set up a camp and carry more items. You also get a weapon to defend yourself and some swordsmanship to use your ax! 6. Tamer - This character template starts you with the skills to control basic animals and heal them. 7. Mage - This character template starts you with the skills to cast magic spells and gives you a few basic spells to start with. This is one of the hardest ways to start in the game. I do not recommend this for a first timer. If you want to try a mage I recommend the bard first as it will give you an easier way to make money and start you with magery. 8. Advanced - This allows you to choose any three skills you want with the exception of a few, and you get a ticket to use to train skills at a vendor. I recommend this only after you have played around with the other templates or understand the game better. Which to choose? Well, that is up to you, remember you get 15 character slots in total over three accounts, so try them all if you want. They are all pretty good, there is no wrong option! You can't make a mistake, the skills go up and down quicky in the beginning and it is a lot of fun to explore! You are now a character in the world and can do things, congratulations. You will receive young player status during your first two days with us. This keeps you free from many of the dangers that are part of daily existence in these Outlands. Whilst a young player on Shelter Island, you benefit from many special rules. ● Other players may not attack you, or steal from you. ● Monsters will attack you. ● On death, your starting blessed possessions will remain with you upon resurrection. ● Town-folk will offer training by clicking on them and then using your new player point ticket, which will allow you to train 100 points of skills free. However, trainers will only train up to 50 per skill. Please be aware that leaving Shelter Island will remove your young player status and new adventurer guide assistance. Speaking of which, there are two ways for you to leave. There is a moongate up the stairs to the Northeast of here (to open your radar, press ALT+R), or a passageway under the Inn. Choose your own adventure! Click here to obtain a map of Shelter Island that will help you get your bearings. Click the guide button at the top of any menu window to have access to more detailed information. Menu Bar: Map, Paperdoll, Inventory, Journal, Chat, and Help. 1. Map. This opens a small map with directions on it. You can double-click it to make it bigger. 2. Paperdoll. This will be explained in detail in the next section. This is where you equip items and many other things. 3. Inventory. This opens your backpack, which you can see in the picture, has 3 other bags in it. 4. Journal. This is the history of things going on around you. You can open it if you were not sure of a message or something that happened on your screen and scroll to read it. 5. Chat. Ignore this it is not used. If you want to chat, you just start typing and you will see your message on the bottom of your screen. Hit enter to send it to the people around you. 6. Help. This is a very useful button that has a ton of information about all sorts of things. At first, a lot of it will be useless as you are still learning the game, but later it will be a place of constant interaction and search. If you get stuck or something is going wrong in the game you can use the "in-game help" button on this help menu and request assistance by using the options available. You can also contact staff through discord. Status Bar: The bar with three blue lines is the status bar. It displays your health, mana, and stamina. I will cover these in more detail later. You can also double-click this bar to get the more detailed version. If your status bar goes away you can put your mouse over your character and click and hold, this will "drag a bar". You can also do this to other things in the game that are living to see their health. Book: The book that is open you can right-click to close it. It is not important and you will never see it again. This brings up a good place to explain the different ways to interact with the interface. Most everything can be closed by right-clicking it in this game, and most things can be opened by double-clicking them, except for buttons on the menu or paper doll, they only need to be clicked one time with the left mouse button. 1. Help: the same menu as the other help button. You can also contact a game master or counselor to get help or access the new adventurer guide. 2. Options: this is where you can configure more advanced options, the only one I recommend messing with is setting your character to always run. You can find this by clicking options -> clicking the mouse icon - > check your character will always run if this is checked. Then press Apply and Okay. 3. Log Out: takes you back to the log in screen. In UO when you log out, you do not always instantly disappear, so try to find safe places to log out when you are done for the night. 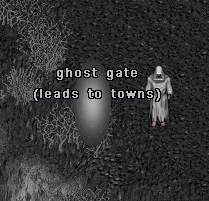 I recommend towns near NPCs. 4. Quest: This will take you to the available Societies assignments. 5. Skills: This is where you can see your skills for your character and how they are progressing. I will explain this in more detail in another section below. 6. Guild: This is where you can create a guild or accept guild invitations. Players have to invite you to a guild. Make friends, the game is more fun. 7. Peace/War: This toggles the mode that puts your character in the stance to attack things by double-clicking them, which is how you will attack monsters, people, animals, etc. You can also activate this mode by pressing Tab. I recommend using Tab instead of this button. 8. Status: This brings up the detailed version of the Status Bar. You can also access it by double-clicking your status bar. Backpack: This is the location of all of your items on your character. The items you start with are usually newbie. This means if you die they will come back with you when you are resurrected at a healer or an anhk. The backpack has a default limit of 125 items and a set amount of stones(which is the weight of things in UO). You can pick up things from corpses and place them in your backpack, this is called looting. You can also pick up items from the ground as well that other players might toss out. Now that we have covered the interface basics, let us talk about the basics of moving, targeting, harvesting, attacking, looting and more. To move around the land, select a direction around your character, and right-click and hold. The mouse cursor will always point away from your character, and you will move in the indicated direction. Holding the cursor further away from your character will enable you to run. If you have enabled always run, then you will always run. To pull the health bar of a player, NPC, creature or monster, simply hold your cursor over the target, hold down left click and drag - a coloured health bar will be created, which can be used for purposes of targeting. An alternative to this is to hold ctrl+shift - this will offer a box that can be used in the same way (left click and drag). Resources can be harvested from creature corpses or geographical features such as mountains or trees. To begin harvesting, you need to arm the correct tool. For Mining, this would be a pickaxe. For Lumberjacking, a hatchet. For Fishing, a fishing pole is required. To harvest skins or meat, you need a Skinning Knife. Once the correct tool is armed, simply double-click the tool, then target yourself and nearby resource nodes will be automatically harvested. The resources you gather will be collected in your backpack until you reach maximum weight. 1. Blue - this person is a not a criminal and if you attack this being or do any negative actions towards them you will turn into a criminal. Becoming a criminal means you can be freely attacked or guard killed if you are in town when committing this negative action. 2. Grey - this is what the majority of monsters in the game will be, grey color means that this person/monster/animal is free to attack and perform negative actions against. You will not go grey and become a criminal from attacking grey colored things. All monsters are grey and all animals unless tamed are also grey. 3. Green - this color means they are in your guild, you can attack them or whatever you want with no consequences, but you should ask before randomly attacking guildmembers. 4. Orange - this color means that you are in a guild which is part of a faction or is at war with another guild. This means this person can attack you with no consequences and most likely will want to attack and kill you and take all your things. 5. Red - this color means the person is a murderer and is out to kill players. Run as fast as you can if you are unprepared to fight them! If you are prepared rally your friends and bring down the murderer with your skill or numbers! Remember if they die, they have to pay the murderer penalty! But becareful, if you die you lose anything in you might have that isn't blessed or newbie. Now that you understand hues, to attack something you just drag its bar and double-click it, or just double-click the actual creature. This will begin your character swinging at the thing you attacked. Tip: If you are curious about how strong a monster is before you attack it, click on it once and bring up the menu and use animal lore. This will give you information about the monster. 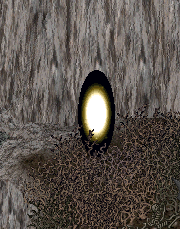 When you kill something in Ultima Online, they will die and fall to the floor, leaving behind a corpse. You can open the corpse by double-clicking it. When you double-click a corpse it will open with items and whatever is in the corpse. You can drag those items from the corpse to your backpack to loot them. This is the basics of looting. I recommend enabling the auto open corpses setting on Razor at this point. The 5th checkbox down that says: Open new corpses within 2 tiles. It might already be checked, but just in case check to make sure. This option will save you the trouble of having to open every corpse every time you kill a monster. Now the corpses will just open if you are beside them when they die, thus saving you a lot of trouble. The 5th checkbox down that says: Open new corpses within 2 tiles. It might already be checked, but just in case, check to make sure. This option will save you the trouble of having to open every corpse every time you kill a monster. Now the corpses will just open if you are beside them when they die, thus saving you a lot of trouble. Note: If someone else is killing the same monster you are, there is a chance they did more damage and the monster corpse will be blue to you, if so, looting this monster will turn you grey. So be aware of this if someone is around you killing the same monster as you are and is not in your party. Note: There is no autoloot feature on UO:Outlands. All looting is done manually. You can buy and sell things you find or make to vendors NPCs. You will see them scattered around town. As you would assume each vendor has a specific type of items they sell. Blacksmith sells things a blacksmith would make and need. Tailor sells tailoring things. Healer sells healing things, so forth and so on. Here you are presented with three options. 1. Buy: This opens the buy menu, where you can look at their offerings and trade gold in your backpack or bank account for their items. You click the ones you need and press accept. 2. Sell: This opens a similar menu to the buy menu, except you are selling items in your pack that they are interested in. If you have nothing they want, they will tell you as much. If you have something they want you can click them to sell them to the vendor and they will take the item and give you gold in your backpack. 3. Train: This allows you to train skills up to 50 from an NPC. You can find the NPC that trains the skill you want by looking around town for them. When you click this option, the NPC will tell you for how much gold they will train the skill. 1 gold = .1 skill. For Example: 100 gold = 10 skill points. So if you have 0 skill points in that skill and you train the skill and give the NPC 500 gold they will train that skill to 50. You can also give them the starting voucher if you chose the advanced option. To give the NPC gold you simply drag the amount of gold from your backpack to the NPC and let go. Some items are equipment. Clothing, Armor, Weapons, Shields and more. These items are equipable by either double-clicking them or dragging them to your paper doll in the position they go. When you equip something, it can also be lost when you die and will be on your corpse. The status bar, when expanded, has a lot of important details. 1. The first column contains three numbers with arrows beside them. From top to bottom, Strength, Dexterity, and Intelligence. These arrows are used to lock in stats. You can only have 225 total stats, so as you get near the cap you can use the arrows to adjust the way that you will gain one stat and lose another. Strength: determines how much life you have and how much you can carry. Dexterity: determines how fast you can attack, how fast bandages heal, and how much stamina you have. Intelligence: determines how much mana you have to cast spells with. 2. The second column contains the values influenced by their statistic. Life total, Stamina, and Mana. As you can imagine when life is 0, you are dead. When stamina is low you are forced to walk, and you swing weapons slower. When your mana is below the amount required to cast a spell, you cannot cast that spell until your mana regenerates. All of these values slowly regenerate depending on how well fed your character is, and if you have the skill meditation. 3. The third column contains how many followers you have, meaning tamed animals or summons, your armor rating and your backpack item weight over the max weight you can carry. 4. The fourth column contains food countdown timer, murder count, damage range, and gold in your backpack. 5. The fifth column contains, criminal flag timer, murder count decay timer, pvp combat timer, and bandage timer. In Ultima Online there are animals that you can ride. You can find these animals in the wild to tame, or you can purchase them off the stable NPC. After you have an animal to ride you can mount the animal by double-clicking it. To get off the animal double click yourself. On Outlands you are allowed to ride mounts anywhere in the world except dungeons. When you enter a dungeon you mount will automatically disappear and is safe. When you exit the dungeon your mount will appear under you and you will be riding it. The most common mounts are horses. In the late game, there are rewards that allow you to carry a mount token in your backpack. These tokens will allow you to instantly ride a mount by double-clicking it, even though you have no actual animal under your control. When you double click it, you will demount. These tokens also follow the dungeon rule of no mounts. 1. All Follow Me - Makes all your animals follow you. 2. All Kill - Makes all your animals attack whichever target you select after giving this command. 3. All Guard Me - Makes you animals follow you and instantly attack anyone who you attack or that attacks you. These are the most useful, there are other commands that you can use. You can see those by clicking the animal once and looking at the menu. In order to cast spells in UO, you need a spell book. If you started with one of the templates that use magery, then you will have one with a few spells included. You also need what is called reagents, regs for short. These consist of Black Pearl, Blood Moss, Mandrake Root, Spiders Silk, Night Shade, Sulfurous Ash, Garlic, and Ginseng. There are 8 reagents in total and every spell requires different combinations of them. If you open your spellbook by double-clicking it, you will see the spells you have in the book. You can turn the pages by clicking the top corners of the pages. When you see a spell, single click it and it will take you to that spell page. You can see the reagents required for that spell there. To acquire reagents go to a mage/alchemist shop and buy them using the vendor there. To get new spells you have to either buy the scrolls from the scribe vendor, make them, buy them off a player scribe, or find them on monsters that cast spells. If you do not have enough magery to cast a spell every time you will fizzle. Some spells you might fizzle sometimes, and others you will fizzle all the time. It is dependant on the circle of spell that you are casting in relation to your magery. For any chance at success, you need the same level of magery as the circle is x 10. So to cast a level 4 spell you need at least 40 magery. Once you, however, have 20 more points in magery than the circle of the spell, you will always succeed. For example, if you are casting lightning, which is a 4th circle spell, and you have 60 magery, you will never fizzle, and you can also no longer gain magery casting this spell. 1. Drag the icon off the page in your spell book and double click it. 2. Setup a macro to cast the spell with a keybind by going to razor and clicking the hotkeys tab and going to the spell options. Enter the key you want to use after selecting the spell. They are based by circles, the same ones in your spellbook. For example I am setting the 1 key to cast heal, which is a first circle spell in my spellbook. This is a good place to talk about hotkeys. There are many hotkeys you can add through razor. Spend some time exploring them to see what you might need. For example, there is a bandage self hotkey that will start a bandage on your character by pressing a single key. If you have questions about macros, hotkeys, razor or steam, there is a section in discord called apps-and-scripts. Please ask anything there, we will be happy to help you. These establishments offer valuable services to new citizens. To quickly log out of the game, enter an Inn or Tavern, and your character will log out immediately, meaning you can switch to another character on the same account right away and are not vulnerable to attacks or thefts from other players as your character ‘times out’. Shopkeepers will also sell you various items of food and drink. Watch how much you drink! Tavern games such as Chess are also available. Stables enable you to buy, stable and ‘claim’ pets and mounts. Tamed pets are available to buy here, most important amongst them being mounts such as horses, which enable you to travel the lands at increased speeds. Pack-horses are another useful creature, enabling you to carry a greater weight and number of items with you - simply use them as you would your backpack, but beware! Monsters or other players may kill and loot, or steal from, your pack horse. You are also able to stable a limited number of pets here. The larger the pet, the more stable slots it uses. To stable, simply say “stable”. To retrieve stabled pets, the command is “claim” Some choose animal taming as their main profession - indeed it is considered by many to be the most lucrative profession in the land. However, mastering this skill takes many hours of training. Associated skills can be trained here, such as Animal Taming, Animal Lore, Herding and Veterinary. Healers are the place you go to when you die and are a ghost. When you are a ghost you can run through doors, creatures and other players. Anytime you see an anhk or a healer run towards them and they will offer you the ability to resurrect. You will spawn with very little life, so be careful in your next decisions! You will spawn with nothing but the death robe and any blessed or newbie items, the rest of your gear, loot and gold will be on your corpse. In Ultima Online your character does not get defined by a class or type. In fact, that is one of the many reasons people enjoy this game. You are able to acquire whatever skills you wish up to a limit of 700 points. Eventually, you can raise your skill cap with late-game consumables to 720 points. This allows you to create whatever type of character you want. You can be a crafter with weapon skills, a mage with weapon skills, a bard with mage skills, a mage with crafter skills, an animal tamer with bard skills, or a cook with taming skills! The options are limitless. Of course some combinations will be better than others, and players will generally move towards templates that make sense for a specialized role, however, this is your adventure, enjoy it. When you begin as a new character you will not be at the character skill point max. However, as you kill/craft/tame/etc you will gain skills quickly in many different skills areas. In order to control this skill gain, you can use the arrows beside the skills to enable if they gain, lose or hold. Clicking the arrow multiple times will change the options for each skill. 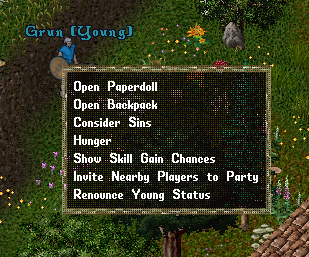 If you are unsure of how to use a skill, open the paperdoll, click the skills button and then find the skill you would like to use in the list. If the skill is an activated one there will be a blue button. Press that button to use the skill. In order to avoid doing this, I recommend creating a hotkey for the skill using razor, similar to how you create one for bandage self. If you feel like you are not gaining skill and you want to know what your chances of gaining are, simply click your character one time and chose the option to "show skill gain chance". This will inform you every time you do an action what your chances to gain a skill are. If you, for example, are casting a magery spell and when you cast it there is no skill gain chance message on the screen after enabling this option, you cannot gain magery casting that spell and you need to move towards harder spells that you might fizzle on. This is also true for many skills, particularly crafting. Outlands has an active skill gain in place. Meaning that for all skills besides crafting, harvesting, and taming you can gain a bonus of 5x the chance to gain a skill for 10 minutes by simply killing any animal or monster. This does not include tamed monsters/animals or ones that were recently tamed and released. It also does not included summoned animals/monsters. Use this active bonus to your advantage! Macing, Swordsmanship, Archery, Fencing - Weapon skills that increase the chances of hitting with the weapon of that type. Tactics - Increase damage with a weapon. Anatomy - Increases damage and increases healing amount with bandages on people. Magic Resist - Lowers damage and spell success against your character from players and monsters. Healing - Allows you to heal yourself with bandages and with enough anatomy, cure poison and resurrect players. You can also heal other players that you are standing next to. Parrying - When wearing a shield allows you to absorb hits and take less damage. Tracking - Allows you to find monsters that may be off your screen and also adds a damage bonus. Musicianship - Increases your chance for success when using the other instrumental music based skills. Discordance - Debuffs the target lowering many values and making the target easier to kill. Peacemaking - Makes the target go into a peaceful demeanor. Whilst "peaced", creatures will not perform aggressive actions. Provocation - Makes two targets attack each other if successful. Blacksmithy - Allows you to create metal-based items and weapons. Repair metal-based items. Create other items. It also gives you buffs for fighting. Carpentry - Allows you to create wood-based items and weapons. Repair wooden items. Create other items. It also gives you buffs for fighting. Tinkering - Allows you to make tools and items based out of wood and metal. You can also create other items and set traps. Lumberjacking - Allows you to harvest wood from trees. Equip a hatchet and go near trees, double-click the hatchet and click the tree or yourself. This will cut wood and put it in your backpack. Mining - Allows you to harvest metal from the ground which you smelt to ingots. Go to mines and equip a pickaxe, double-click the pickaxe and click the ground or yourself. This will mine ore which you can smelt and make items from. Camping - Allows you to set camp to move around, also carry more items and more weight. Animal Lore - Allows you to control your animal. The required taming for an animal also requires the same amount of lore to control it. Thus if an animal has 75 taming requirement, you also need 75 animal lore to control it. You can also use animal lore to check out your animals and to allocate skill points and stat points as they level up. Veterinary - Allows you to heal pets with bandages. Similar to healing a player, you must be next to your pet. The animal lore skill is used to determine if you can cure pets and resurrect them(if bonded). Herding - Allows you to focus your pets anger on the target increasing your pets damage to that target. Use your herding staff to do this. Magery - Allows you to cast spells from a spellbook or from scrolls. Scrolls have a default +20 magery when used. See magery section above for more details. Meditation - Allows you to regenerate mana, the more meditation you have the faster you mana will regenerate. There is active and passive meditation. Use the skill to gain a bonus meditation rate while remaining still and doing no other actions. Armor effects mana regeneration. See the detailed skills link list for more information. Evaluating Intelligence - increases damage dealt by magery spells, important to aide in using offensive magery to kill targets. Wrestling - Increases damage with no weapon equipped, helpful to avoid getting interrupted when casting spells. Again the above summary is for an explanation of the skills you start with the starting template. For an extensive list of skills please see the detailed skill list link. Also if you have questions there is a new support-newplayer channel in discord. We highly advise you come and ask any questions as lots of people are happy to answer questions you have about skills, items or anything related to the game. 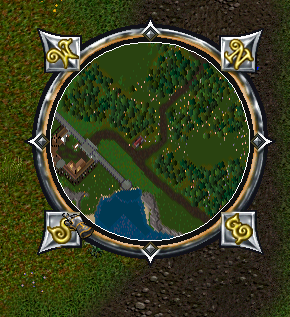 As we near the end of this guide I would like to talk about one of the unique things about Ultima Online. In this world, players can attack you at any time and you can attack other players at any time. This means that you cannot trust anyone, and I mean it. Do not, by any means trust anyone until you have good reason to trust them. People will steal, lie, cheat and murder you at any point when you are outside of the guard zone. This does not mean that everyone is bad, most people are nice people who would love to help slay monsters and help harvest materials with you. I just want to put it out there that you might be attacked by a player at any point once you leave Shelter island and are outside of the guard zone. With that being said there are some things you need to know. 1. When in a guard zone, if someone attacks or steals from you, you can say "guards" and the criminal will be killed by the guards. 2. When someone murders you, you can report them as a murderer. If the player receives enough murder counts, he or she will go red. 3. If you murder someone after 5 murders you will go red. Murders decay over 72 hours of in-game time. So be careful murdering people out there folks. Be safe and have fun. Remember you can attack anyone who is grey with no consequences. Be aware they can attack you back if you have attacked them. Later on, when you have learned a good bit about the game and raised your skills, there are lots of ways to take part in consensual PVP, meaning two or more players looking to fight each other. So as time goes on and you see people running around fighting and you want to get into that type of gameplay make sure to ask how in discord. Last but not least, remember it is just a game, and most items are easy to acquire. If you get murdered or a thief steals one of your items, figure out a way to protect yourself in the future. Maybe hunt near the golden moongates in dungeons, or hide your valuables in your backpack in a chest that locks. There are many player solutions to problems that occur from people in the game. You can always make friends and hunt together and group up to accomplish a strategy versus that lonely PK! Maybe one day, once you have raised your skills and have been in many battles, you will help avenge the young players of Outlands. The best way to have fun in Ultima Online is to get out there and explore. Once you feel confident and leave shelter island there is a vast world awaiting you. Get a mount and run around. Explore, craft and fight your way through dungeons and the many levels within them. Remember each dungeon is unique and they all offer increased difficulty as you work your way through them. Eventually, they lead to a boss! Find friends and work together. If dungeons are not your thing, there is a big beautiful world that has been created just for you. There are shrines that will have special PVM events daily, there are unique areas full of interesting monsters and gorgeous buildings. Eventually, you are going to die. When you do your screen will turn grey and you will become a ghost. There are two locations where you will die: in a dungeon and out in the wilderness, commonly called overland. When you die in overlands your goal will be to look for a healers caravan. If you look closely on your map you will see them as a pinkish rectangle. You can see one here in the middle of this map. When you die in a dungeon there will be two options for you as a ghost. You can find the golden moongates and use them to go to a town areas, or you can look for ghost moongates. They will only be visible as a ghost. These will also take you to town areas. Once you have resurrected in town you can resupply and go back to get your corpse and all of your loot, if it is still there and no one has taken it. Your corpse will remain for 15 minutes. So you have a good amount of time to get back to your body. Remember, you can join discord and get help at almost any time of the day. Meet friends and find future guildmates to hang out and play with. Good luck and have fun. 10/2/18 - Updated information about death moongates. Updated some information about skills and how to use ones that are not obvious. 10/11/18 - Added Beta download link at top of document. This is really, really great! Thanks for putting this together! Get this man some Prevalia coins! This is a work of art. kudos. Thank you SO MUCH for this guide! I havent played UO in almost 2 decades and I was asking in Discord if there was a guide for people who didn't remember anything about UO! This is perfect! Does this guide have any changes that are specific to UO Outlands? Thanks! There are some changes, but this guide is mostly about how to understand the basics to function in the world. If you are looking for more detailed information about Outlands specific content, I would check the wiki and the other forum post here as lots of people have posted tons of information on the test they have done. Grizzly has several threads with tons of juicy outlands specific testing. Sure...I just meant the basic stuff. I assume that even some basic stuff from UO is radically different in Outlands, and I was just curious if those differences were reflexted in the document. I'm an extreme noob and need this basic info! Thanks. Sure...I just meant the basic stuff. I assume that even some basic stuff from UO is radically different in Outlands, and I was just curious if those differences were reflected in the document. I'm an extreme noob and need this basic info! Thanks. The basics for a new player are pretty much the same. The differences are the quality of life changes like better gumps, smart harvesting, etc. I have outlined as much as I could that reflected those changes. There is so much custom stuff to detail that it would take ages to write, there is a ton of information already written to that subject as well. I am glad this was a help, welcome to the server. Wow, this is fantastic. Thanks for all your hard work on this, Yu! I will add that now. I assumed everyone who got this far would have downloaded the client already. Bad assumption. I also put it at the top of the document. Easy enough to follow even with ADHD. Thanking you! Beta is over. The link to play now is on the home page in a big red button that says play now! UO Outlands is my first UO experience ever and this is a HUGE help to get me to understand what the hell is going on. I've now raised my skill in noob by %0.1... i'm still on shelter island but my skills are getting closer to 70 so hoping tonight I can see some more of the world, I'm a solo player so I hope I don't get griefed too much. Thanks again! Welcome to the addiction! The next step is discord using the #newplayer channel for more help. Updated a few things that were incorrect now.